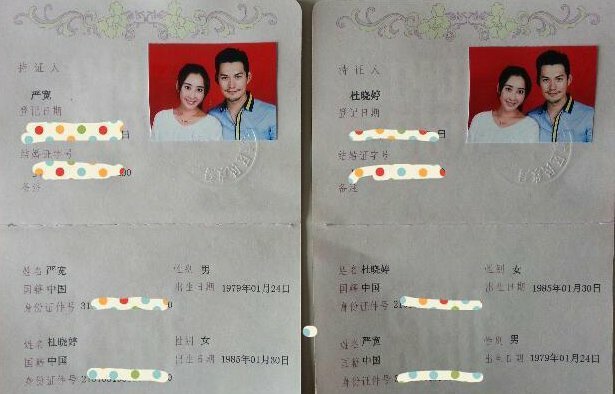 Mainland Chinese actor Yan Kuan (嚴寬) and his actress fiancée Sunny Du (杜若溪) officially registered their marriage a few days before Chinese Valentine’s Day, which takes place on the seventh day of the seventh month in the lunar calendar. Yan Kuan and Sunny have been a couple for four years and collaborated in the TV dramas Love Love <戀了愛了>, which aired in March of this year, and Girlfriend’s Lover <閨中密友>, which was broadcast in June. The two became engaged in early April, when Yan Kuan proposed to Sunny after she finished performing in a stage play at the Shanghai Drama Art Center. As of now, the newlyweds have not yet decided on an exact date for their wedding ceremony, but they revealed that it would happen either at the end of this year or at the beginning of next year. In the meantime, fans can look forward to the upcoming drama Blood Oath <血誓>, in which Sunny stars and Yan Kuan has a guest appearance. charming man, like his appearance in Longmen Express. Waaa, he’s so cute but don’t know the wife. cute pair…. Wow, a real gentleman now a day’s hard to find a man like Yan Kuan so understanding and protecting and so romantic..lucky girl. But I have to say, Yan Kuanhas stuck by her thru thick and thin and Sunny by him when he was depressed! Feel happy for them to make the journey to marriage!